It’s the last day of Passover and Miriam is sick, sick, sick of matzo! But when she learns why we eat unleavened bread during the eight days of Passover, she considers changing her mind. 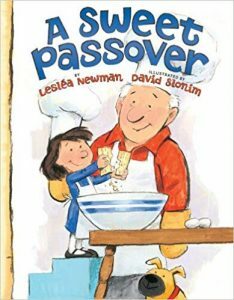 A loving intergenerational story about a sweet holiday. Read more about the writing of this book. “On the seventh day of Passover, Miriam ate lots of matzo by herself. She ate matzo with almond butter and matzo with apple butter. She ate matzo with blueberry jam and matzo with strawberry jam. She ate plain matzo, egg matzo, whole wheat matzo and chocolate-covered matzo. Read the review at Children’s Literature Network. Read the review at Kirkus Reviews.